More specifically, does your business need a rooftop air conditioner? After all, our weather is mostly hot and humid the majority of the year. And efficient commercial air conditioners are important for businesses in the West Palm Beach area! 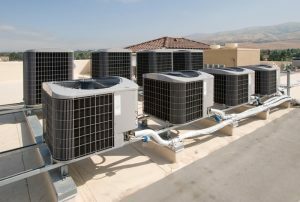 Whether you run an office, warehouse, retail store, or multi-unit housing, you have to provide the building with proper cooling. And that cooling system must perform as expected day in and day out. When you have trouble with it, you need a good HVAC contractor to manage the problem quickly and effectively, without disruption to your business. In almost all cases, modular rooftop AC units are the best way to deliver cool air into your commercial space. Modular units involve exactly what the name implies—identical HVAC units, each capable of delivering a certain amount of cooling power. But why place them on a roof, and why use modular units rather than a single AC system? There are a number of good reasons, all of which provide key benefits to your office or business. The leading reason businesses and commercial space owners use modular units is to adapt to the changing priorities of a given space. A residential system rarely needs to change all that much when a family grows or a new family moves in. It’s still cooling the same amount of space, after all. But this isn’t necessarily true with commercial spaces. If you have new tenants entering the space, new cooling needs may need to be made. Or if an existing business expands then additional cooling needs probably need to be met. Modular units enable this to take place without a great deal of fuss. You don’t have to replace the entire HVAC system, rip out ductwork, or deal with any other expensive operation. You simply add another modular unit to the system to improve your power output, or disconnect one to lower if necessary. The roof makes the perfect location for such units, as your HVAC technician can do the work without disrupting any business within the building itself. Rooftops also prove ample space for expansion, since it usually has more than enough room to accommodate more units. The rooftop location of your commercial HVAC system provides both accessibility and ease of access that an indoor unit simply can’t provide. This is especially pertinent for businesses, since repairs, replacement, and maintenance can disrupt your day-to-day operations a great deal. HVAC technicians who need to move heavy equipment throughout a space can be really disruptive, as can the noises of fixing a piece of HVAC equipment like an air conditioner. Depending on the nature of your AC problems, it may even force you to send your staff or tenants away while the work is being done. The rooftop placement of your commercial HVAC system will eliminate any of these concerns. It’s easy for our team to access, and our technicians can bring equipment up from the outside of the building in most cases. Whether you’re looking for reliable residential or commercial HVAC services in West Palm Beach, FL, we are the team to call. Contact Envirotech Air Quality Services today!